The Texas board of education is the most influential group of educators in the USA and they hold enormous political and financial sway over textbook publishers. They are using their influence to inject a more Christian perspective into the curriculum and the nation's textbooks. Texas is one of the nation's largest textbook markets because it is one of the few where the state decides what books schools can buy rather than leaving it up to local districts, which means publishers that get their books approved can count on millions of dollars in sales. Further, publishers craft their standard textbooks based on the requirements of the biggest buyers. As a result, the Texas board has the power to shape the textbooks that children around the country read for years to come. Varying estimates claim that between 45% and 85% of American classrooms use Texas state textbooks (Univ. of Texas Study, Keith A. Erekson). Over the course of the current review, the board has been focusing on infusing the school curriculum with broader conservative and religious themes. In Science, there has been an insistence on questioning the theory of evolution. And during the review of the history standards, the more conservative members have attempted to define the United States as a Christian nation governed by Christian principles, and emphasize the concept of "American Exceptionalism." 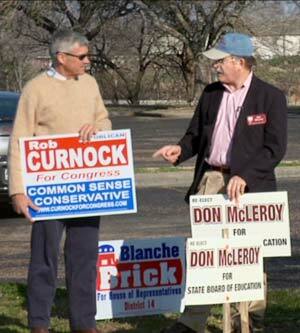 After the 2006 election, Republicans claimed ten of fifteen board seats. Seven of those seats were held by the ultra-conservatives, and one by a close ally, giving them an effective majority. THE REVISIONARIES shines a spotlight on the key players effecting the US high school textbooks. The main characters in this film represent a wide array of personalities and desires. Some see the Board as a stepping-stone to future political success. Others see it as their ordained quest to preserve the teachings of the Bible. Still others see it as their duty to ensure that their children, who are in the public schools, have access to the best possible education that will prepare them to compete for jobs in the global marketplace. In all of this, one thing is assured, these board members are in the right place at the right time. They have the opportunity to affect a generation of Americans. And as Abraham Lincoln said,"the philosophy of the classroom in one generation will be the philosophy of government in the next." Texas is ground zero for the textbook wars across the country. Our film confronts the critical issue and key players in the Texas State Board of Education's textbook standards revision process and how this impacts the entire US education system. The goal of our film is to illuminate the political wrangling behind the board that has gone on since the '80s, and bring attention to this largely overlooked, yet vitally important group of people. The Texas State Board of Education is a modern, moral battleground in the national debate between conservatives and liberals in this country. THE REVISIONARIES gives a face and a personality to these political fights. Filming for over three years, Scott Thurman has captured on film all of the intense debates, vote trading and compromises amongst the board members. Showing the back room discussions between the board members and the experts. He is with them as they make their decisions. But, first and foremost, this film is about people, those few passionate citizens who are fighting to shape the course of American education, and the future of America with it.